ENERIA in the Champions League ! Saturday 16th of September, UEFA Champions League day, a game with two beautiful clubs was programmed. 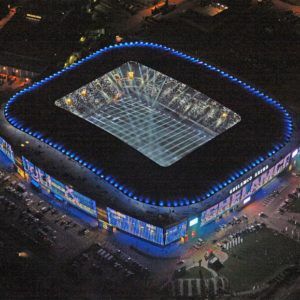 The game was on for KAA Gent against Olympique Lyonnais in the Ghelamco arena in Gent. In emergency cases the Caterpillar stand-by generator set would power the essential electricity in this enormous stadium. This day nothing occurred in order that back-up power was needed and the game ended in a draw 1 – 1. The Caterpillar stand-by generator set, delivered by ENERIA Belgium, has a rating of 550 kVA stand-by power. The installation of this genset was in collaboration with the electrical installation company VMA in Sint-Martens Latem. As a result of a careful preparation, qualified Caterpillar technicians and a professional follow-up the installation time was minimized. The entire installation process, from installation up to and including commissioning of the group took just three days. Note that the genset was installed on the top level of the football arena. A top-quality product delivered by ENERIA for the elite! Share the post "Belgium – Ghelamco Arena Stadium – An Emergency Power backup solution"